Last February, as part of the annual 5-week intensive Advanced Online Storytelling course that I teach at Northwestern University in Qatar, my students created a multimedia website that explores Doha’s architectural history and ongoing journey, as well as the city’s environmental and cultural sustainability initiatives. The site is called Building Doha and features video, photo, print, animation pieces and an audio podcast. The Qatar Green Building Council aided us in this endeavor through a series of informational lectures they organized for us before the students began reporting. The site was a big hit! We held two public presentations of our work; the latest one was just yesterday on Nov 2nd, as part of a symposium titled, Towards Cultural Sustainability: Exploring Doha’s Urban Consciousness. The site was also featured in local media, including the Peninsula and the Gulf Times. And now we’ve won an award for our work! 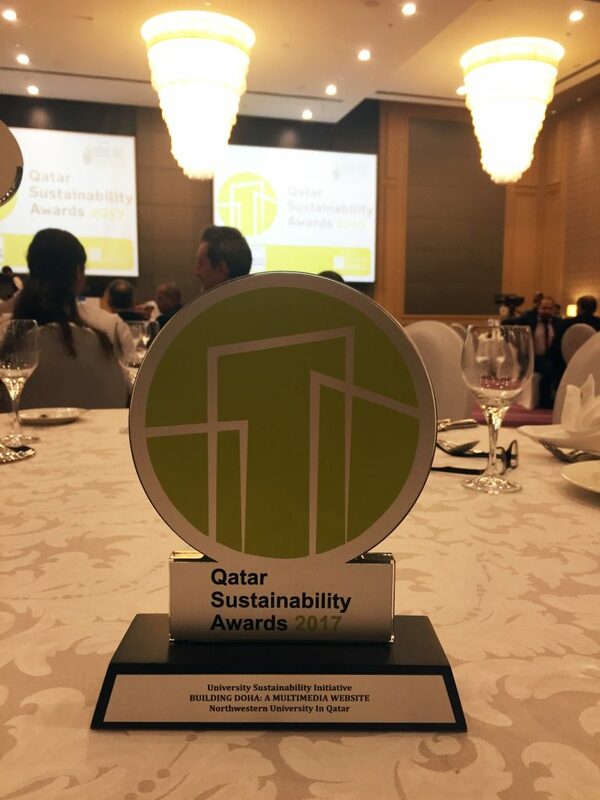 As part of the QGBC’s annual conference and sustainability week, the organization also holds the Qatar Sustainability Awards. This year a team of green building and sustainability experts voted our website as the winner of the University Sustainability Initiative category! My students are thrilled that they can add this achievement to their CVs, and, of course, I am very proud of their work. Below is a picture of the beautiful trophy we won for our work reporting on cultural sustainability issues.